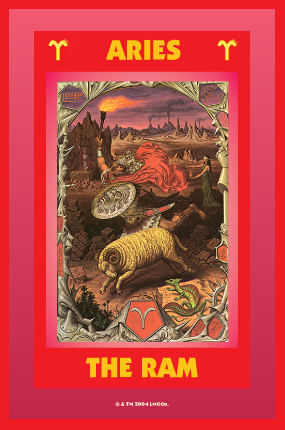 Aries the Ram: March 21 - April 20, Cardinal Fire, ruled by Mars. If you were born between March 21 and April 20, Aries is your sign. You are a natural leader, brave and stormy in character, and very energetic. Take advantage of any opportunities that may present themselves to advance yourself socially. Your executive ability means that you dislike working under others. You will have many love affairs. You are clear-thinking and positive immediately after your birthday. Be generous and true to those you love although it is not your tendency to sympathize with the weakness of others. When trouble brews, as it may from time to time, good judgement and careful consideration of your problems, rather than rash impulsiveness, will help you to avoid any serious consequences. 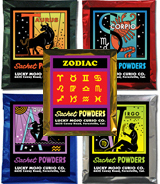 Tuesdays are lucky days for you. Birthday -- March 21 - April 20. 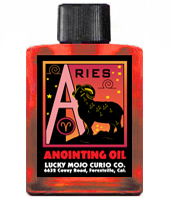 Keywords: Creative, energetic, adaptable, and insightful. Anatomy: The head, brain, eyes, and face. 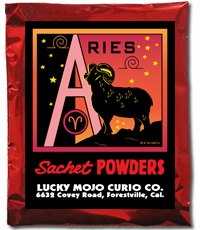 Lucky Colours -- Red, Scarlet. 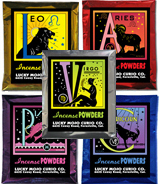 Order Aries Incense from the Lucky Mojo Curio Co.
Order Aries Bath Crystals from the Lucky Mojo Curio Co.
Order Aries Sachet Powder from the Lucky Mojo Curio Co.